I'll often bang-on about cask strength this and SWMS-that on this blog, because I love the idea and I (generally) love such whiskies. I do need to remember though, that my palate wasn't always that way. There was a time, many years ago, when I called a Glenfiddich 12 "strong", scoffed at anything above 43% ABV, and preferred my whisky with Coke, or at the very least, dry. When I first received an e-mail about SIA, I thought...hold up...Scotch, US? I was intrigued. 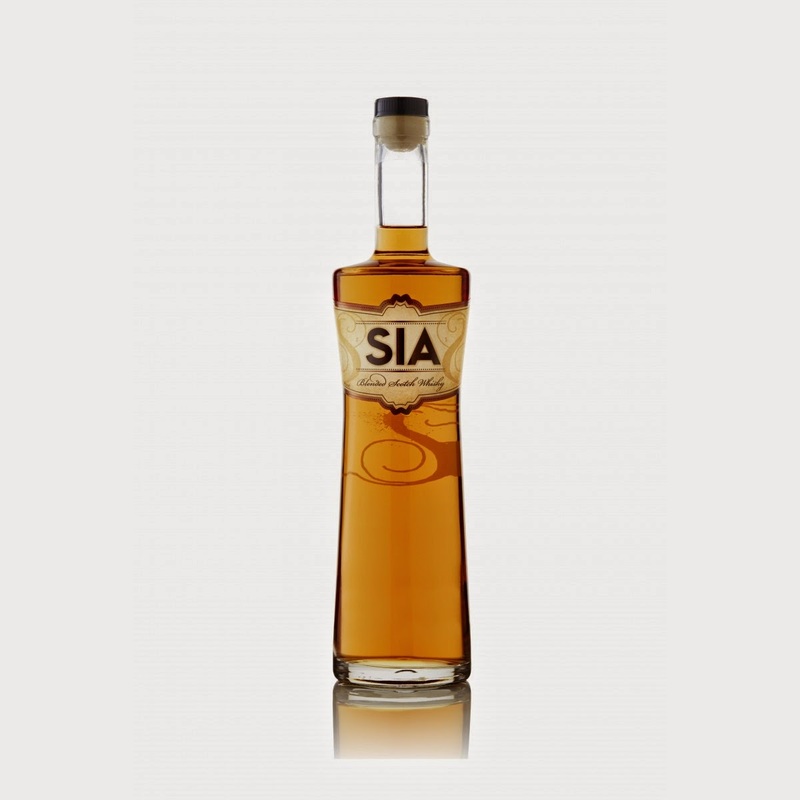 The name ("SIA") also didn't sound like any distillery, brand or release I'd heard of. What was this all about? 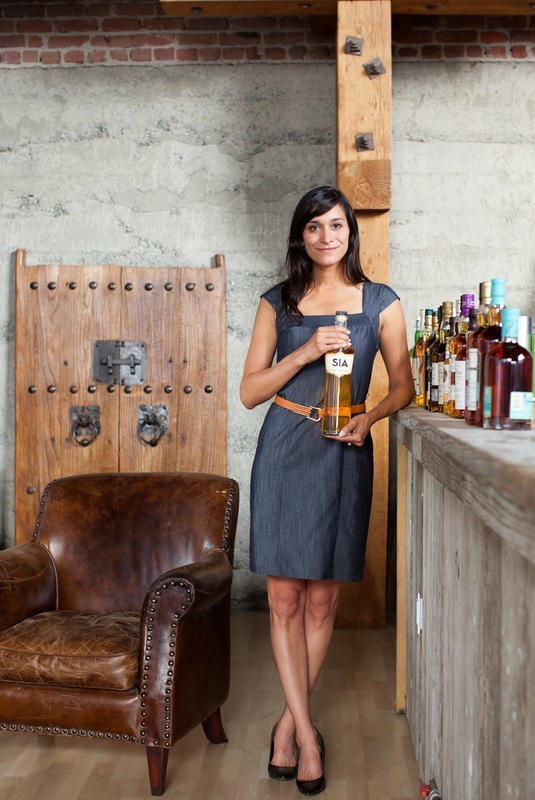 Turns out, SIA Scotch is all about the ambition of Cuban-born, San Francisco-based Carin Luna-Ostaseski, who decided to turn her passion for whisky into something more, and produce an affordable, easy-drinking whisky for a younger audience (an audience who, we presume, probably don't even realise they like whisky at first). 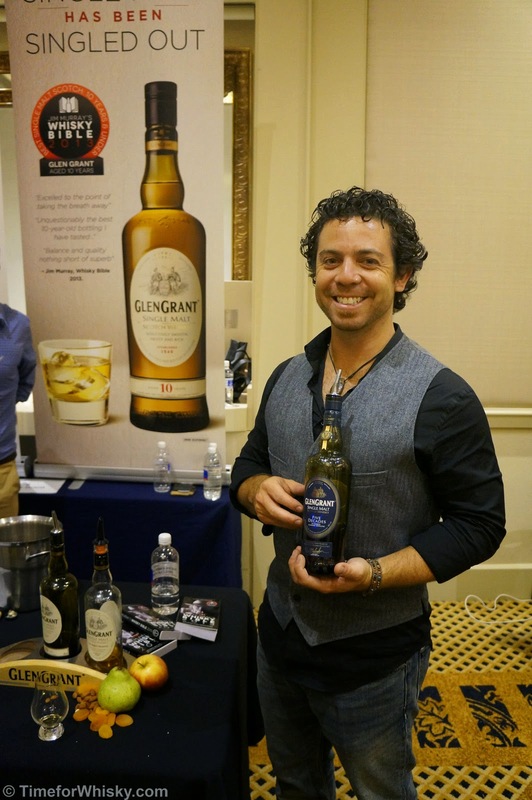 So how does a San Franciscan go about releasing a Scotch whisky? That's where Douglas Laing come in. Masters of the world of vatted and blended malts (and single cask releases, for that matter), and no stranger to this blog, Douglas Laing produced a blend to meet the needs of SIA's target audience - with a 40% malt / 60% grain ratio, and a regional breakdown of 50% Speyside / 40% Highlands / 10% Islay. So it's made by a very well known icon of the whisky industry, it's got a popular regional make up (if it works, why mess with it?) and a decent amount of malt whisky in it. Sounds good so far, and while approachable, custom-made blends may not be a unique thing, the way this whisky came about certainly was. The result of a successful Kickstarter project, SIA Scotch raised over $45k USD in 40 days, and has since gone on to be sold in over 200 bars, restaurants and shops in the US. As I read up on the background of SIA, it was clear there was a huge amount of effort undertaken to bring the whisky to market, including researching over 80 distillers, conducting blind tasting sessions and experimentation with blending based on the results, 8 months' work on the bottle and packaging, and no doubt many headaches dealing with the various regulatory requirements in bringing an alcoholic beverage to market. As someone who previously had no ties to the spirits industry (much like myself), I think it's a huge achievement. SIA Scotch recently won a Double Gold at the SFWSC, and whilst I've often commented that spirits fairs (and their related awards) are a dime a dozen, there's no arguing that it went up against a number of other whiskies in its category, and came out with the equal top honours (besting several more expensive Johnnie Walker blends and equalling the likes of Chivas Royal Salute). The bottle (and name), to my mind, is slightly "feminine", but hey, if that's going to open up the category to the most number of new drinkers, I'm all for it. It's the whisky inside that counts. ...speaking of which, we've received a sample kindly sent by the US distributor, and will be tasting it on the blog shortly. If it's as good as the back story and the idea behind raising the awareness of whisky for a whole new audience, it'll be a great drop. Expect our tasting notes soon. SIA Scotch can be found online here and retails for $49.99USD. The NZ Whisky Company, whom we visited back in January 2013, have just made NZ the first nation outside Japan and Europe to release a 25yo single malt whisky. 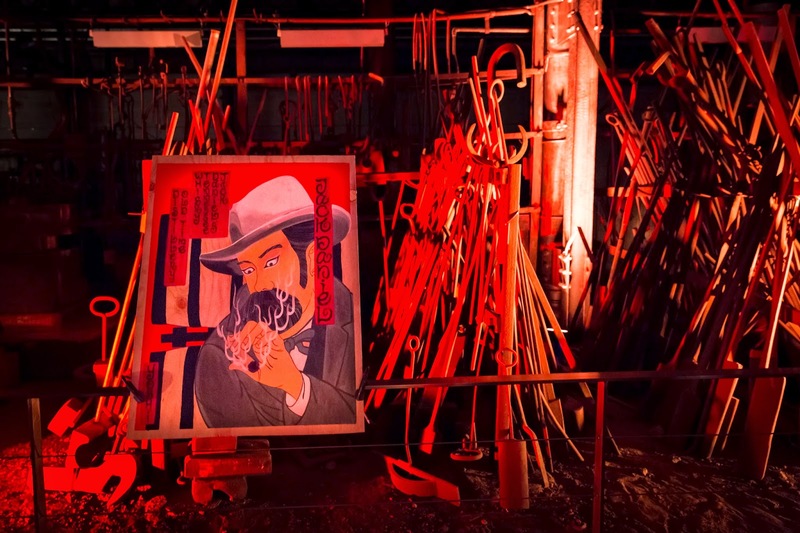 "Oamaru, New Zealand– Oct 7, 2014 – New Zealand has become the first nation outside Japan and Europe to mature and release a 25 year old Single Malt whisky. Following extensive barrel selection, the company has released a limited quantity of just 484 bottles onto the market. 'We are so grateful for the international support of the world’s whisky community over the last four years, which has given us the confidence to launch our 25 year old,' says company CEO Greg Ramsay. 'We are already humbled by the pre-orders and glowing feedback of those who have taken their first sips. The 25 year old, made from 100 per cent malted New Zealand barley distilled in the lost Dunedin distillery, has been aging in American Oak, ex-bourbon barrels from Four Roses Distillery for a quarter of a century. The rich flavours have softened and sweetened into a complex array of tropical fruits, butterscotch, toasted orange peel and a hit of sea spray. The 25 year old is a salute to the craftsmanship of those early distillers, including Cyril Yates who played a hand in this newly released drop. 'It’s got to be made properly all the way through from the farmer growing barley to the cooper sealing up the staves, and then it does the magical maturation in the barrel before coming out as liquid gold,' explains Yates who dedicated 40 years of his life to the New Zealand whisky industry. Following an international design competition, the packaging for the 25 year old emerged. Greg Walko and Petra Kosik, hailing from a small Hungarian design studio took honours, trumping a strong international field. With its contemporary styling, the packaging brings a quarter-of-a-century-old drop into the modern day. As well as regaining the foothold once held across New Zealand by Wilsons, the whisky is now exported from Oamaru and available across Canada, the UK, Australia and Europe. The 25 year old is now available for pre-order at www.thenzwhisky.com"
We've featured anCnoc on the blog previously, and now the Knockdhu Distillery has just released another new offering in the form of the 2000 vintage (no age statement provided though presumably 13-14 years). No word on AU or HK pricing yet. "anCnoc Highland Single Malt Scotch Whisky is proud to announce the release of Vintage 2000, another remarkable single malt in the line of exclusive vintage releases from Knockdhu Distillery, celebrating the art of whisky-making with a modern twist. 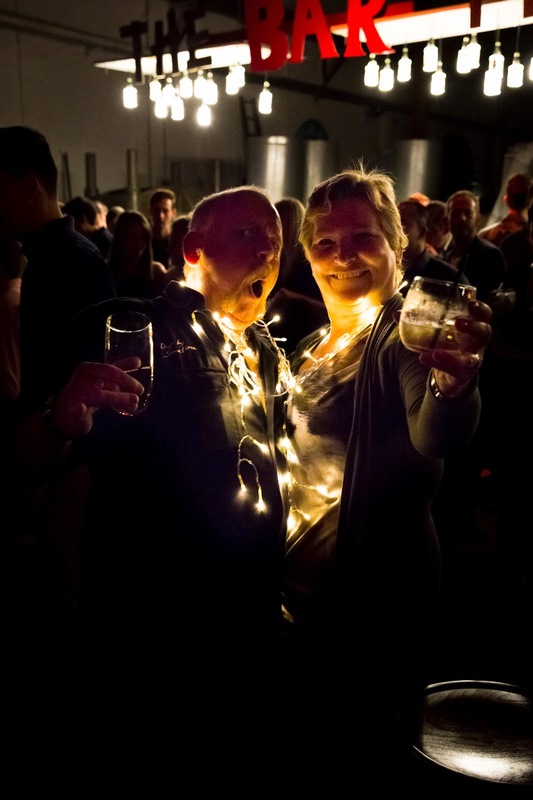 It has become a tradition at anCnoc to annually offer vintage releases from consecutive years to the most dedicated whisky fans around the world. Only 1,000 cases of anCnoc Vintage 2000 will be made available in select markets from September 2014. The whisky was selected and bottled with the most discerning whisky drinker in mind and will offer a wonderful insight into the distillery style and the impact of on-site maturation in a combination of Spanish oak ex-sherry butts and American oak ex-bourbon barrels. anCnoc Vintage 2000 has been bottled non chill-filtered, at its natural colour and at the premium strength of 46% ABV. Hot copper in colour, the whisky is dark and masculine on the nose. A surge of ground Oriental spices, burned vanilla and unrefined cocoa beans gradually relaxes its grip and subtle aromas of lemon grass, orange peel and fragrant cut flowers come to life, unmistakably highlighting the provenance of this remarkable Vintage. On the palate it is smooth but firm-structured, envelops the mouth in creamy vanilla, spicy sherry notes, pralines and silky tannins. Lively citrus follows shortly after leading to a long, balanced finish, finally revealing a whiff of wood smoke. anCnoc Vintage 2000 will be available in the UK, Sweden, Japan and Russia, to name but a few markets, at a recommended retail price of £55." 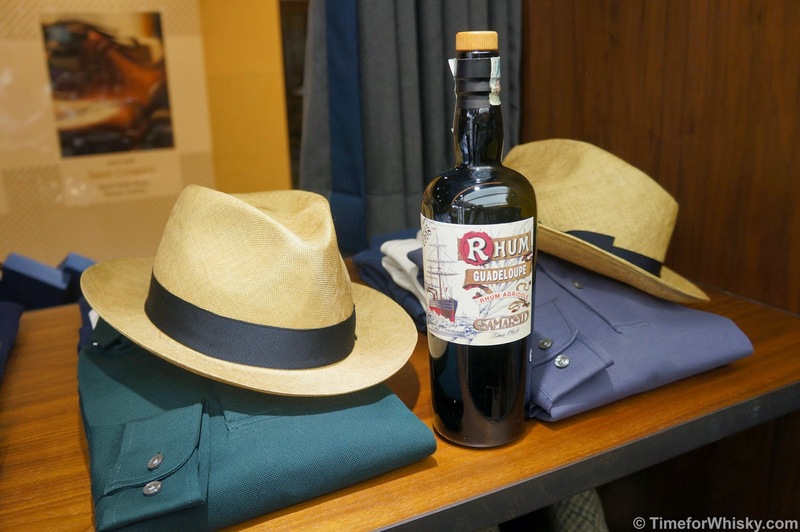 Eau de Vie launch "Malt Masters Club"
In a similar vein to The Wild Rover's CCWC, TimeforWhisky.com favourite Eau de Vie (one of the first Australian bars to feature a serious whisky backbar before it became "a thing") are will soon be launching their own whisky club. "Eau De Vie will soon be launching a Whisky Club, memberships cost $75 and this gets you access to a whole range of exclusive offers. Upon registering for our Malt Masters Club you will receive an Eau De Vie whisky journal of 40 select Whiskies as a true representation of malt, you will then be entitled to 20% off this selection at Eau de Vie Sydney and Melbourne. 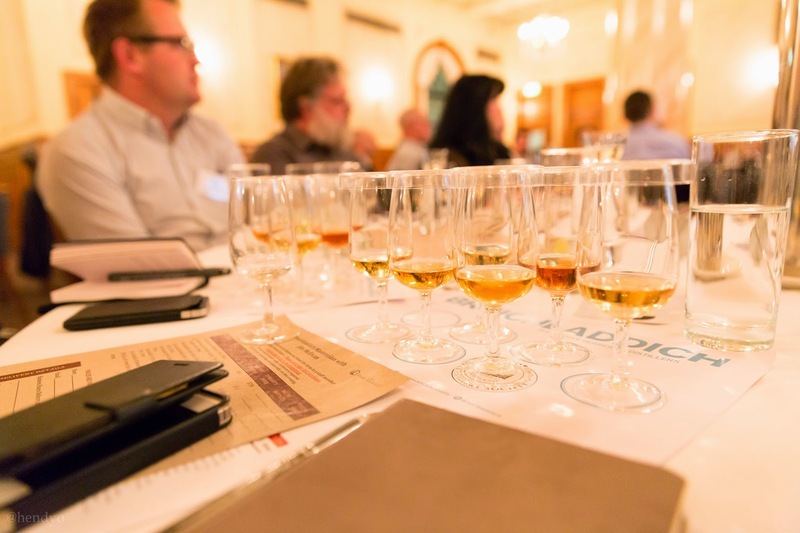 Eau de Vie Malt Masters is a whisky club aimed at raising the awareness of the malt whisky category and with the goal of encouraging our guests to explore the wonderful world of malt whisky. Once you have made your way through all 40, you will officially be made an honouree Malt Master and have access to our reserve cabinets at a heavily discounted price. 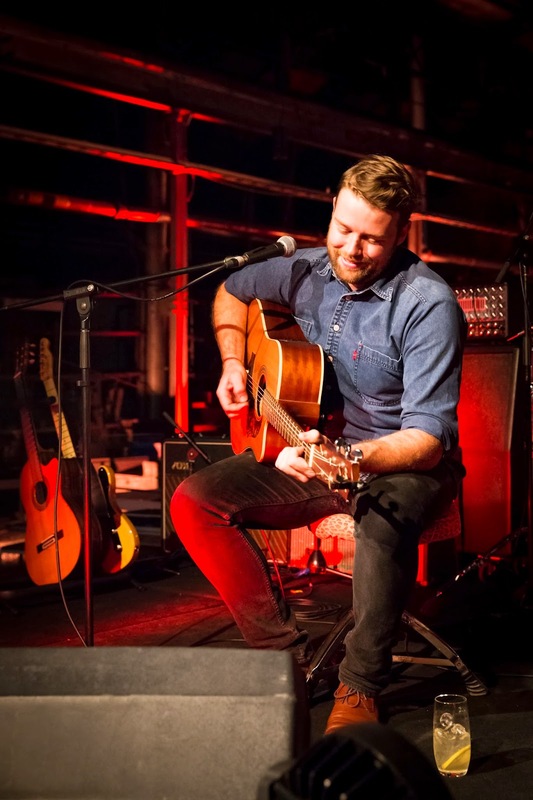 Send your contact details to Jamie-lee@speakeasygroup.com.au to be the first to know more." Eau de Vie again...this time, offering a unique in-bar experience with a cask of The Glenlivet. Word is the cask is not "live" (apparently, it's lined and the whisky therefore doesn't continue to age in the cask), but still, an interesting concept nonetheless, especially with the whisky not being sold by the glass or bottle, but by 350/700mL portions recorded in a "whisky ledger". Having previously had our own bottle of whisky at Eau de Vie, Steph and I can personally vouch for this sort of thing being a fun experience. "Eau de Vie has partnered with Glenlivet to create a truly unique experience, we have joined forces to provided two bespoke whisky barrels exclusively available at Eau de Vie. 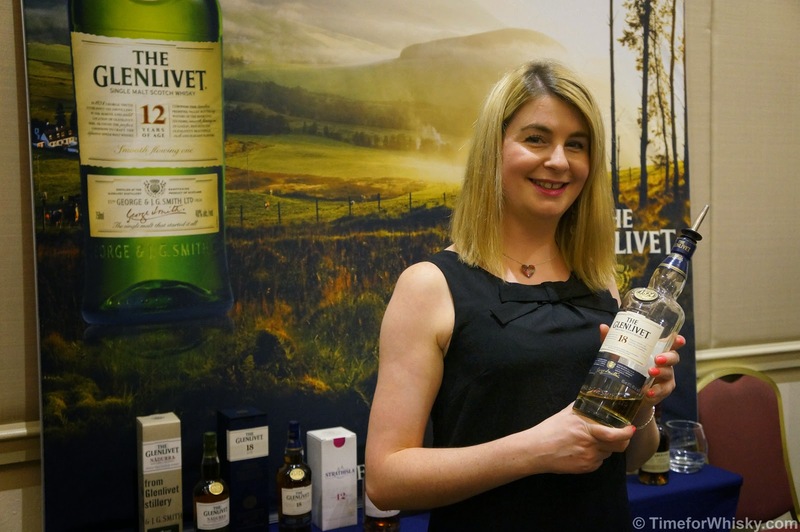 The Glenlivet 16 year old is a cask strength whisky, which can be sampled and experienced only in Eau de Vie. Just as if you were visiting a distillery itself, the casked whisky will be sold in 350ml or 700ml portions and written up by hand in our custom made whisky ledger. 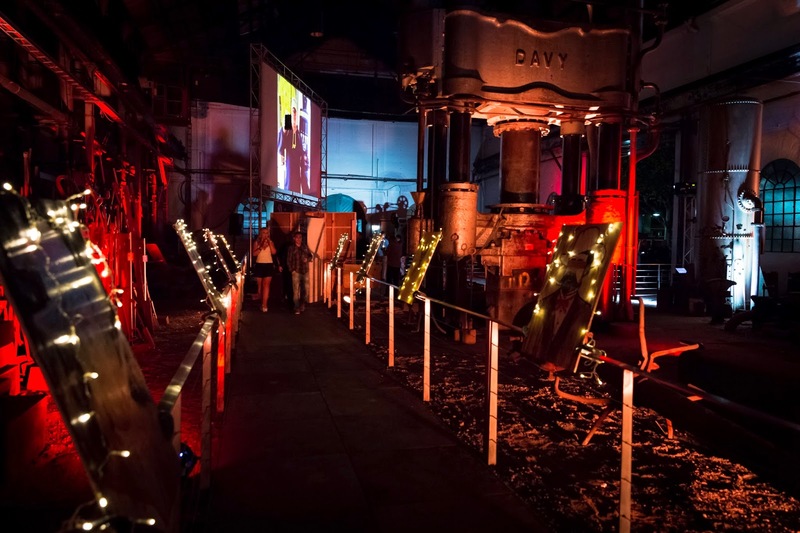 The whisky ledger will be used as the sole record for the experience, where after the initial purchase, the participant will arrive and withdraw the amount he or she will be consuming and logged thereafter as a running tally. The whisky will be drawn from the barrel through a whisky thief, more commonly a "valinch", embodying and authenticity, then disbursed into crystal decanters for their table with all the trimmings, crystal or Glencairn, ice and water. 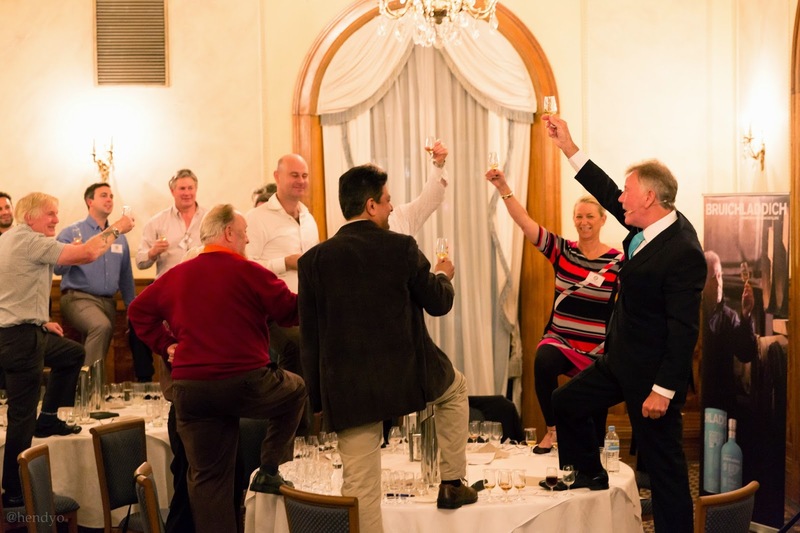 For pre-purchase contact Greg in Melbourne at greg@eaudevie.com.au or Julian in Sydney at Julian@speakeasygroup.com.au"
We've attended Glenfiddich dinners in the past and they've always been a fantastic experience - great food, great whiskies and innovative matching. Now it's everyone's turn to get in on the action, with an upcoming dinner at the lovely Centennial Parklands, Sydney. "This unique six course degustation will be carefully matched to the Glenfiddich range. Each dish will be created from this years Glenfiddich Pioneers Chef finalists who are represented from restaurants around Australia. 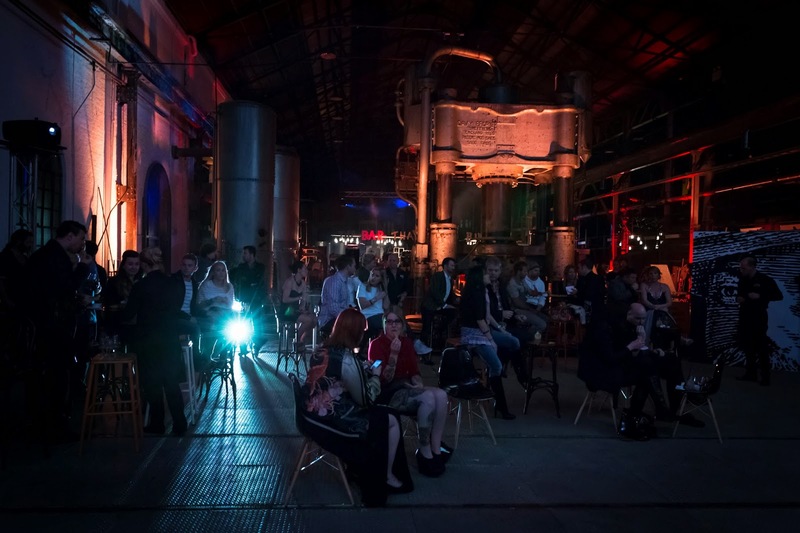 Music, wine and cocktails will also be in plentiful supply, while the final Pionneer Chef winner is decided based on the scoring of all diners on the night. For more information on the event and to book your ticket please use the link below. Tickets are $100 + booking fee. All proceeds go to www.soldieron.org.au"
LABEL 5 is a blend that we haven't featured (or tried) on this site before, but have certainly heard about (and seen all over the shelves at certain bottlos). Regardless, it's sold in more than 100 countries, ranks "10th on the worldwide Scotch whisky market" (in terms of sales presumably) and is blended by Graham Coull, (who we met just over a year ago at the Glen Moray tasting in Sydney), so we figure it's worth a look in. Personal tasting notes to follow. 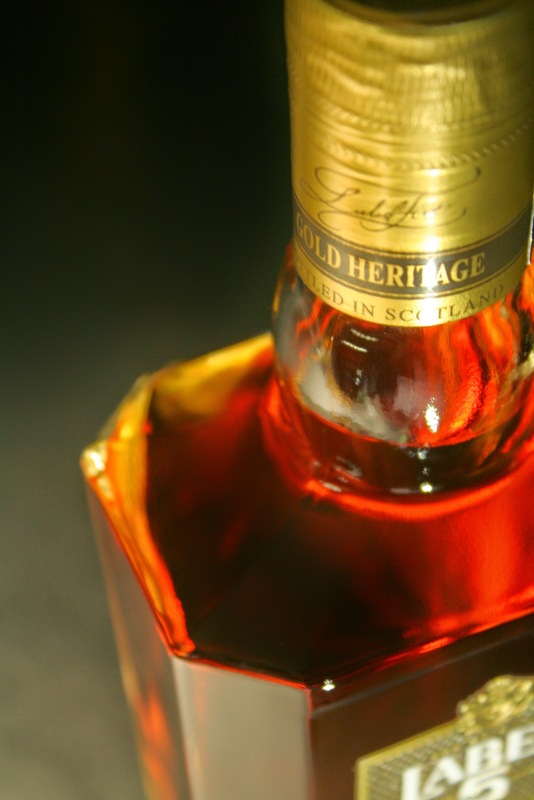 "Bathgate, Scotland, 22 October, 2014 - LABEL 5 expands its range with a new expression: LABEL 5 Gold Heritage. This new offer will be unveiled at TFWA Cannes next October. LABEL 5 Gold Heritage has been created to delight Scotch whisky lovers who are looking to explore LABEL 5’s character in more depth. 'LABEL 5 Gold Heritage is a personal achievement for me. Building on the traditions of LABEL 5, I have hand-selected whiskies from different ages and casks which marry together to produce a wonderfully balanced blend. The result is an exceptionally smooth whisky loaded with fruit, spice, warm vanilla oak and subtle smoke, which offers a unique taste experience.' said Graham Coull." LABEL 5 Gold Heritage is being released in the US initially, followed by China and Australia (RRP TBC). 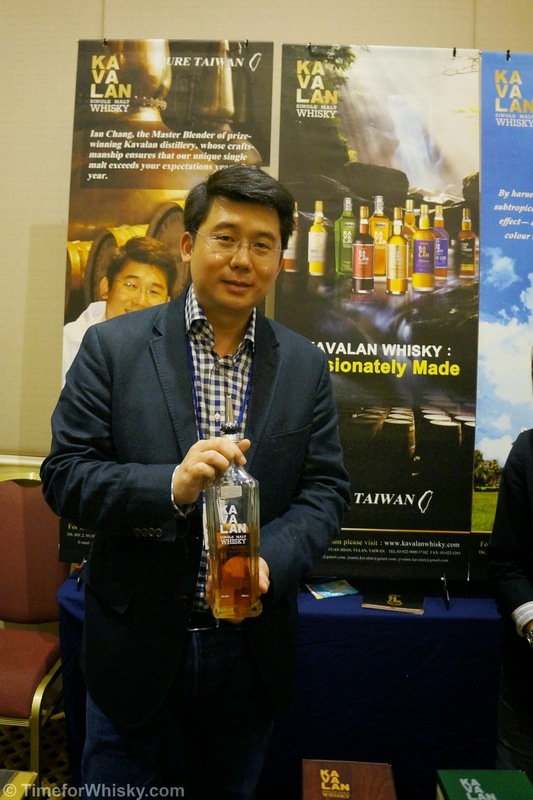 The whisky was recently awarded with a double gold medal at the China World Spirit Awards. 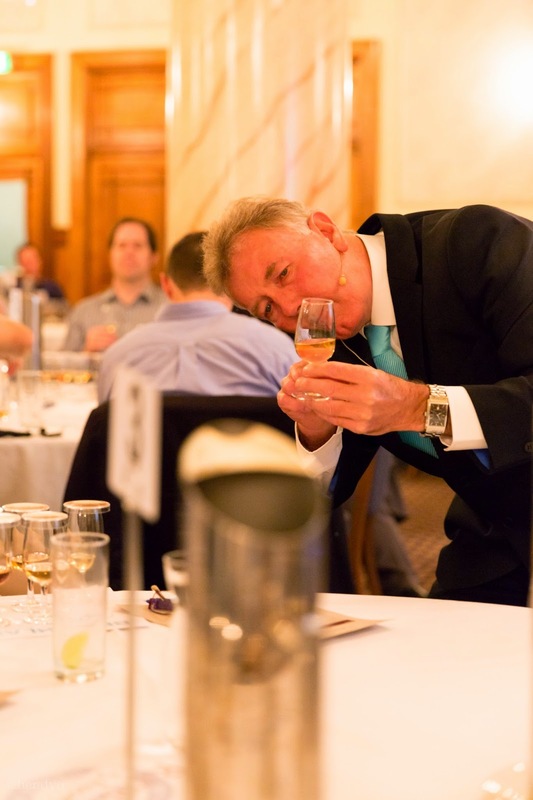 The start of October marked a special moment in the whisky world here in Australia as we were graced by the presence of the respected, legendary, Jim McEwan. The Master Distiller of Bruichladdich toured Australia to share the story of Bruichladdich and his wonderful journey with the distillery. 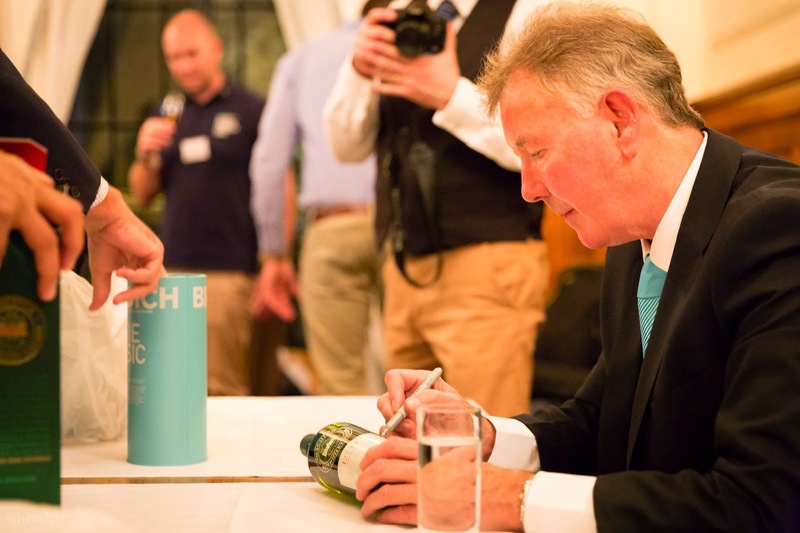 It was not that long ago that we adventured through the exciting Bruichladdich series at the Eastern Hotel and so Jim's visit was particularly exciting and timely. 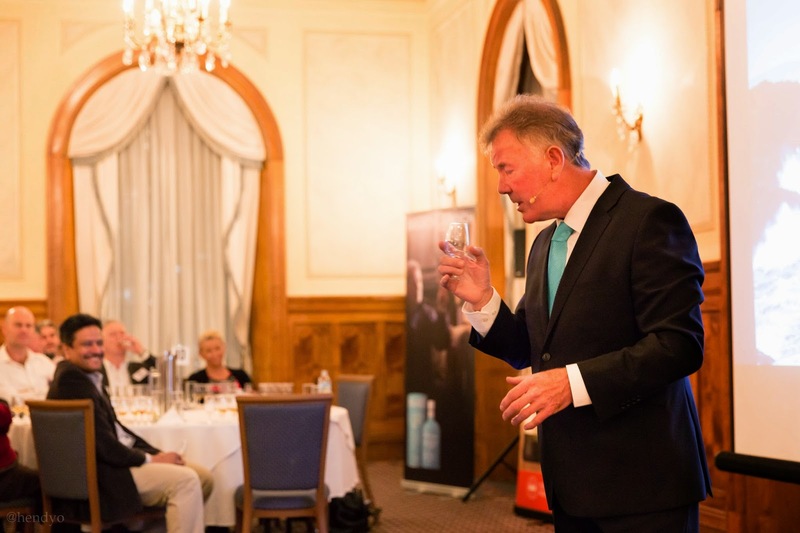 We attended the evening with Jim McEwan as part of the Single Malt Whisky Society event at the grand Royal Automobile Club in Sydney. The ever-knowledgeable Andrew Derbidge of SMWS co-hosted with Jim and facilitated the session. The night began with an unconventional (for a whisky tasting) 'The Botanist' gin and tonic ('The Botanist' being the herbacious Islay gin crafted by Bruichladdich). As Jim put it, at the time, the gin had been crafted when the distillery was going through tougher financial times and could not afford to produce whisky. The remark was not true of course, rather a sign of the wave of light humour that was to come from Jim that night. The story of Bruichladdich is a labour of love. Built in 1881 by the Harvey brothers, the Islay distillery continued to evolve over the century, making use of equipment which has stood the test of time. The distillery progressed further over the years, currently producing approximately 1.5 million litres of liquid gold per annum, yet still continuing to strongly support local Islay farmers and the good folks of the Islay community. 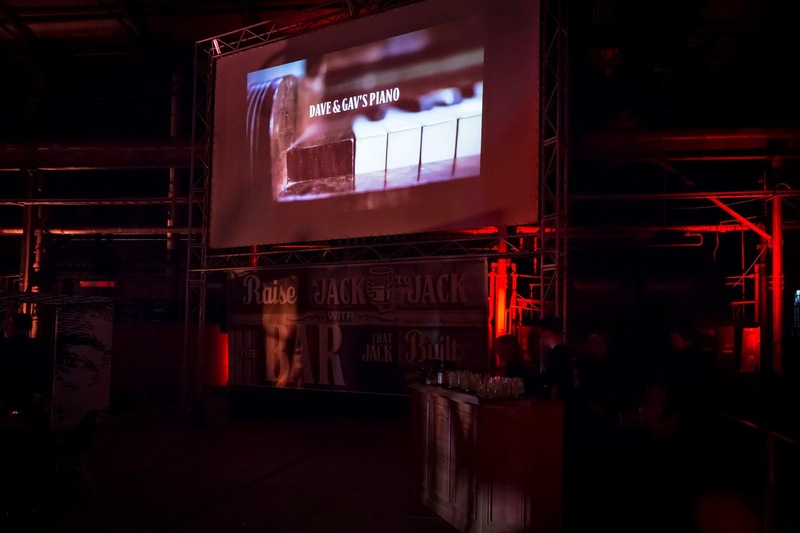 A short testimonial video was shown to the room featuring testimonies from local barley farmers and a number of passionate distillery workers alike, one of which had been ear-marked by Jim as his protege. Jim's own story was equally full of passion and love. Having worked in the whisky industry for over 50 years, Jim worked his way through the ranks. Starting as an apprentice Cooper for Bowmore in 1963, Jim continued his journey through warehousing, mashing and malting before becoming a master blender at one point, and eventually becoming the Ambassador for Bowmore. Jim only returned to the production realm when he joined Bruichladdich in 2000 and has since shaped the Bruichladdich we now all know and love. Throughout the night, Jim shared various stories from his journey as a Master Distiller, stories from the distillery and a few tips for appreciating a good dram including a few experimentations with the fingers. Even through the countless stories though, Jim still kept a single story close to his chest - the story of how the Black Art came about. Few have attempted to unravel the mystery of the Black Art from Jim (and failed). Oh, let's not forget, the eighth dram. 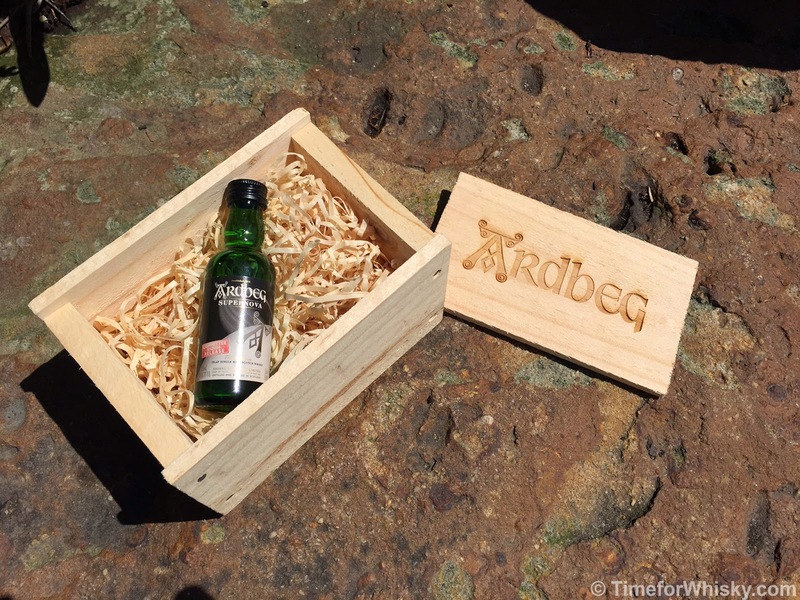 Never had the dram been previewed or tasted anywhere globally before. The inaugural preview of the mysterious, almost six year old, 2008 Octomore (matured in a French virgin oak cask) was something special. The dram was astounding, loads of toffee and smoked ham (with peating levels at 175ppm) and quite a remarkable contrast to the Octomore 06.1 previously tasted. Following the last wonderful mystery dram, Jim then extended an invite for us all to join him in a Highland toast. Having skipped the Port Charlotte Scottish Barley from earlier that night, this was the dram we toasted with. With one foot on the table and our hand raised, we chanted, we sang and we capped off the night and saluted with the aromatic, sweet and lightly toasted dram. Memories from the night will linger on. Jim was simply remarkable, inspirational and legendary. His passion, charm, wisdom and love for distillation truly define him and all his beautiful creations. If you ever do get the chance to see or meet Jim, perhaps around Islay, take it up as it will undoubtedly be the most memorable moment you will have in your whisky journey. 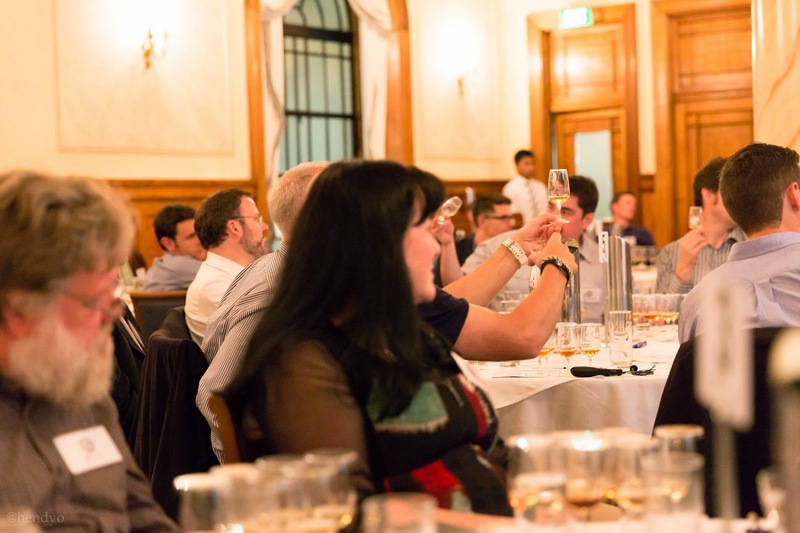 A special heartfelt thanks to the Scotch Malt Whisky Society and Southtrade International for co-hosting such a wonderful and memorable event, and Southtrade for the invitation. 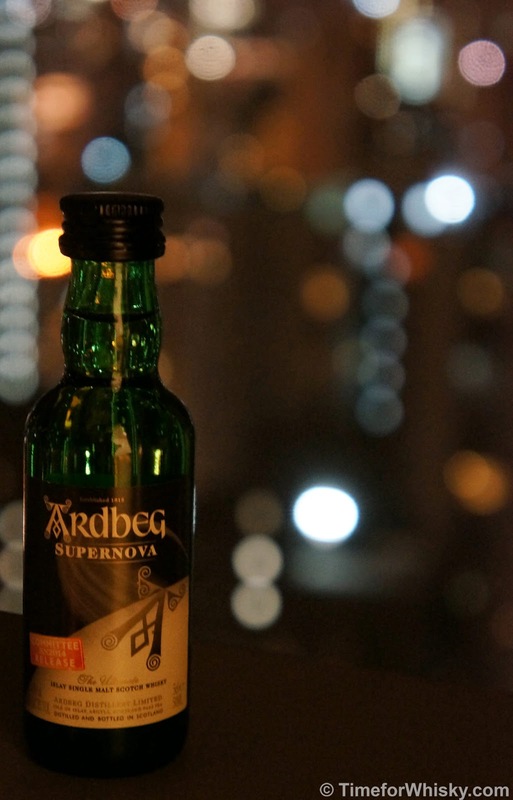 A few weeks ago we brought word of the upcoming release of Ardbeg Supernova 2014 in Australia, and gave a bit of a background to Supernova, from the original 2009 release through to 2014's release. As mentioned, the good folk at Moet Hennessy Australia were kind enough to send a sample of the "SN2014" Supernova, and it's finally time to taste it. @dontgiveadram - I'm willing to pay £400 for that mini. Colour: Light, much lighter than I was expecting (call it a psychological thing, being a heavy, strong, peated whisky with a high ABV). Apple juice-like. Nose: Rich and creamy, with citrus undertones - grapefruit most notably. A serious whisky, no doubt, but one with approachable, lighter elements in both the sweetness and citrus characteristics. Mind you this is all with a big whack of peat in the overshadowing the aforementioned notes. 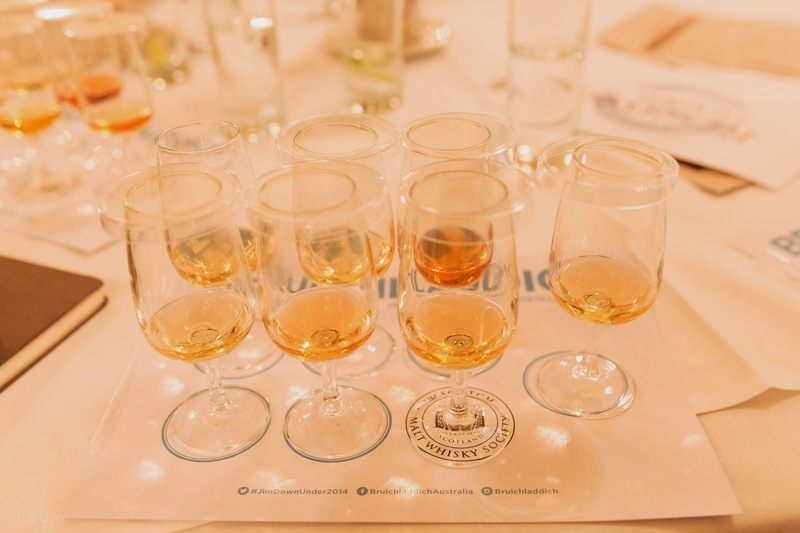 Palate: The peat isn't as pronounced or "in your face" as the nose might suggest. The palate keeps the citrus notes and introduces rich, caramel notes with a hint of maple syrup. The peat lingers, but it's the citrus and sweet dessert-like notes that play the dominant role. Finish: Long and lingering, with peat and interestingly, notes of breakfast cereal. Rating (on my very non-scientific scale): 91/100. 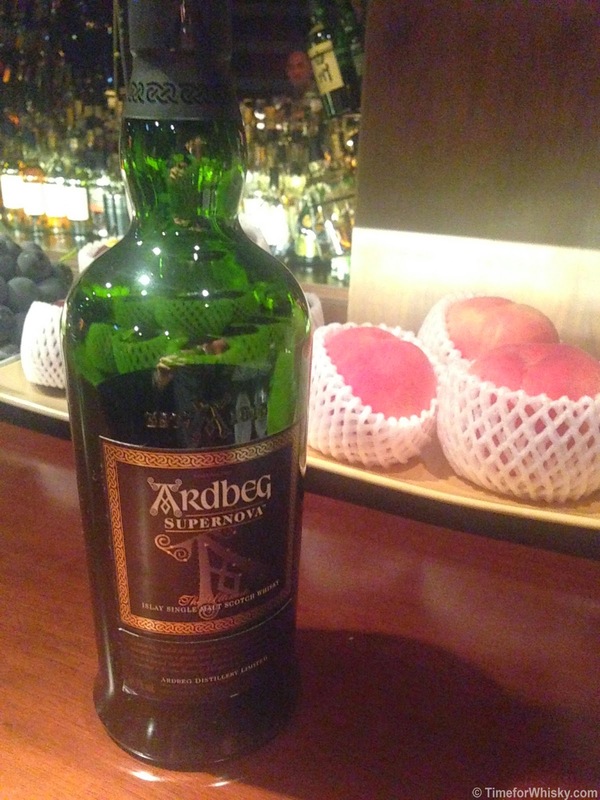 After re-reading my notes, I realised it may come across as a tamer, lighter Ardbeg. It's not. It's still a peaty, 55% ABV beast of a dram, but manages to also be approachable and simultaneously peaty, sweet and citrusy. A one-trick pony it ain't. If you've read reviews of the SN2014 from other bloggers, you may have noticed there's become a bit of a trend of destroying these bottles after tasting. I get it - keep them out of the hands of those who just want to profit, and keep them out of the hands of the counterfeiters who may fill them with Ardbeg 10yo (if you're lucky) and on-sell them. I get it, I do....but I won't be destroying my empty. Simply because it's a cool bottle, unique, rare, and I personally want to keep it in my Ardbeg collection (which though modest, is growing). Nose: Sooty, ashy smoke. I was instantly taken back to my old school camping days. Not so much the smell of a fresh campfire, but the next morning. This was interestingly mixed in with some raspberry notes! Palate: Ashy smoke at first, but then, almost drastically, a change to sweet desserts. Ice cream, peacans and condensed milk (made me a little bit hungry it did). Delicious. Finish: Not as long as I'd expected. 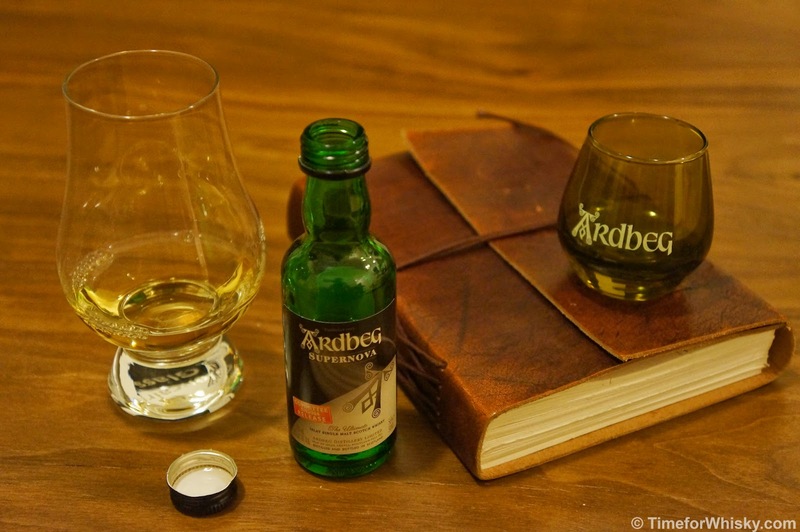 The peat sticks around to the end, as does the sweet, almost sugary notes, but it doesn't seem to linger for as long as say,the Ardbeg Coryvreckan does. Rating (on my very non-scientific scale): 95/100. High score for a great whisky. Wish I first tried it when it was more readily available! 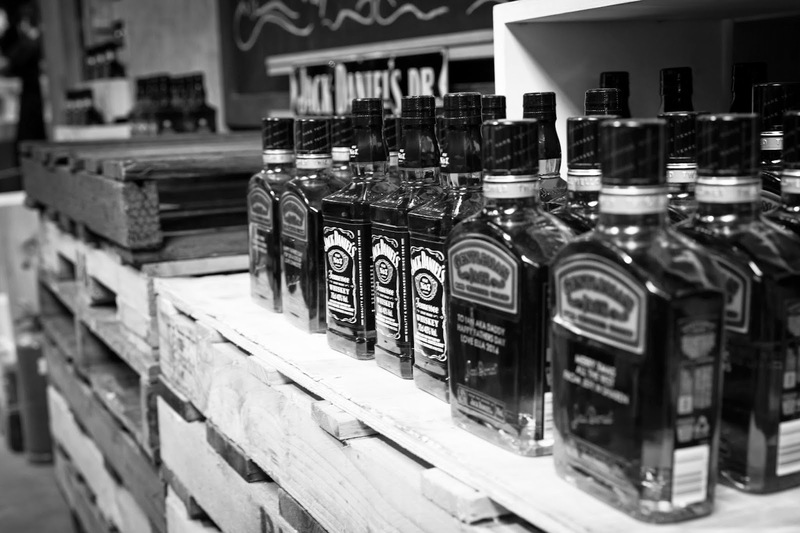 The month of September has always been a month of celebration for Jack Daniel. His exact birth day is not known to many, so celebration of his birthday takes place throughout the entire month of September. Last month, to celebrate 'Jacktember,' a call to Jack's Facebook friends was made. 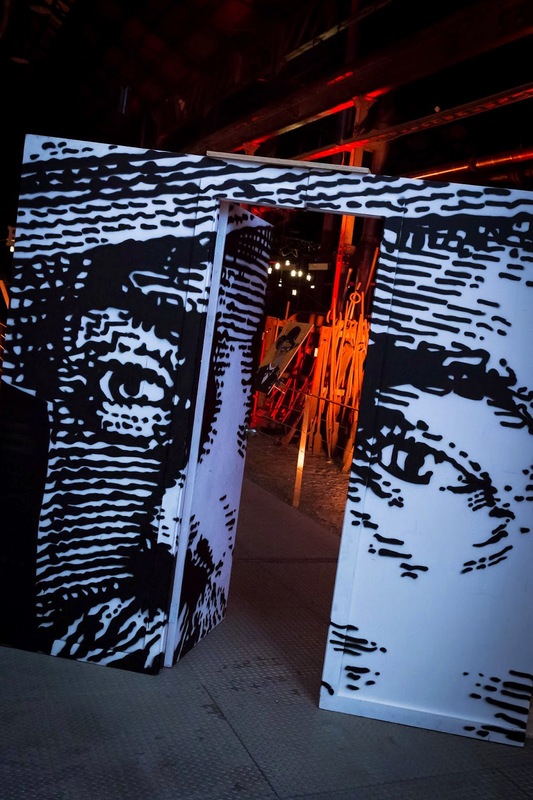 The call was for all who share a passion and love for Jack Daniel's to donate a host of "resources", whether that be materials, time or expertise, to build what would be the first 'crowd-sourced' bar. Fittingly, the bar was named 'The Bar That Jack Built'. The resulting bar; beautiful and impeccable, the hand made bar shared a rustic, industrial and unique feel and showed excellent level of craftsmanship. 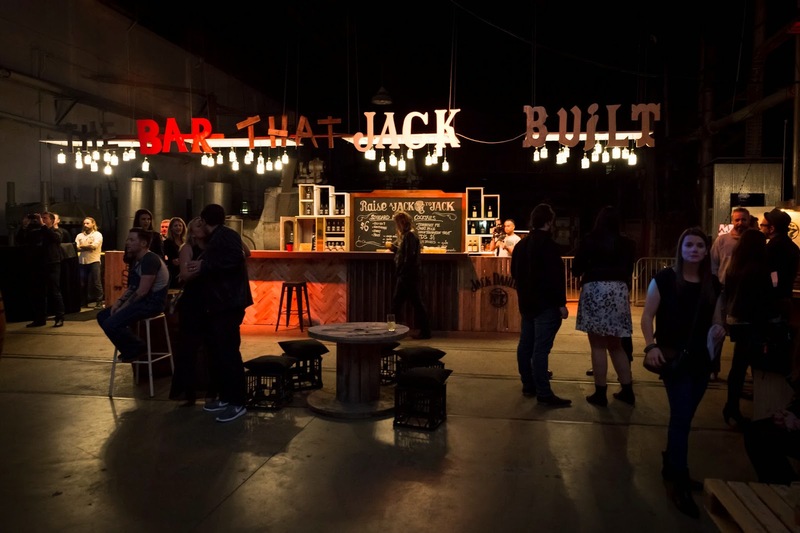 'The Bar That Jack Built' was only open for one night though such curation may inspire others to build other similar 'crowd-sourced' bars in the near future. As the saying on the night went - "Here’s to raising a Jack to Jack." 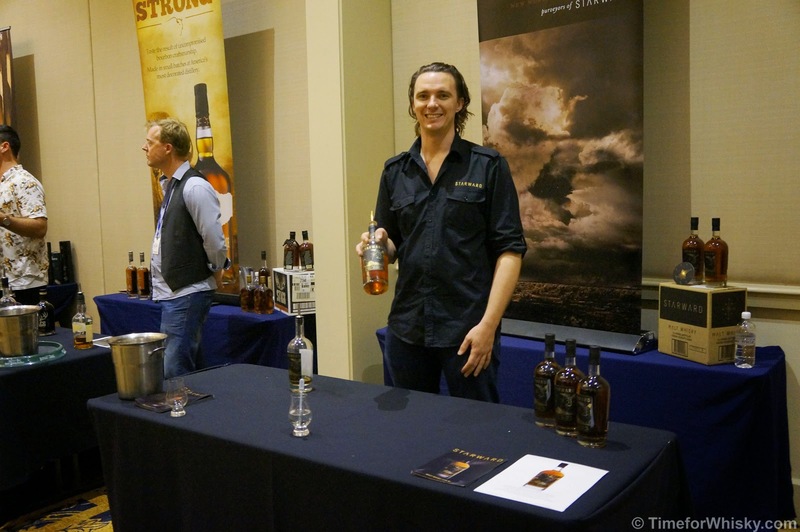 We love our whisky fairs here at TimeforWhisky.com. What better way to meet the people behind the whisk(e)y, chat about whisk(e)y with like-minded individuals and try some rare, interesting, unique and (sometimes) downright weird drams, all with a cost of admission less than a single one of those drams might cost you at a bar? 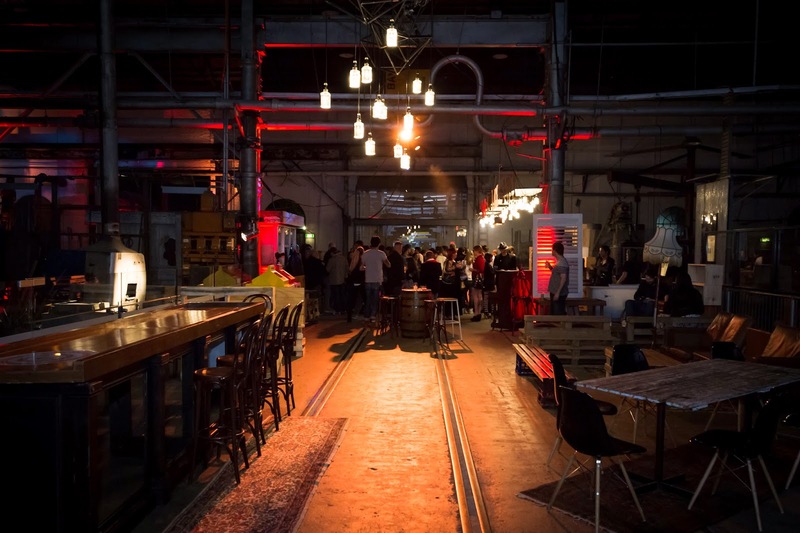 Sydney has three main whisky shows/fairs each year, and they all serve very different purposes. 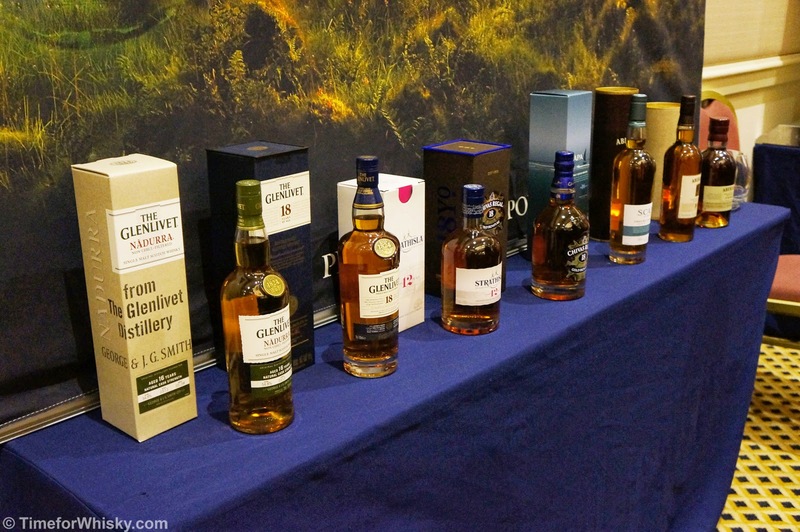 There's our pick of the bunch, The Oak Barrel's Whisky Fair, where you're guaranteed to try some stunning, rare, often one-off drams and meet some real enhusiasts and industry legends (this year for example, they had their own cask of Glenfarclas selected by George Grant himself). 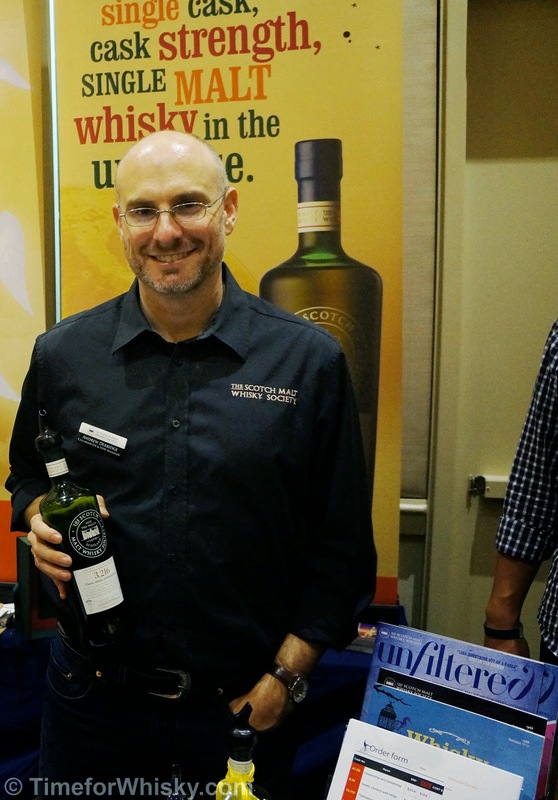 There's Whisky Live Sydney, which is more of a "beginners'" show and may be good if you're just getting into whisky, or you want to try a large part of Dan Murphy's range. 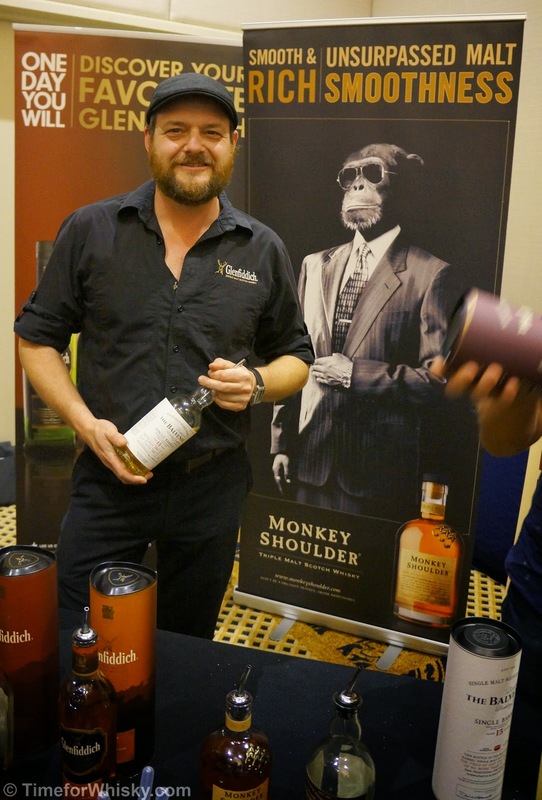 ..and then there's this one, The Whisky Show, run by Double Bay's World of Whisky, held in May this year, and the only 2014 fare we attended (as our July move into Asia saw us miss the 2014 Whisky Fair). 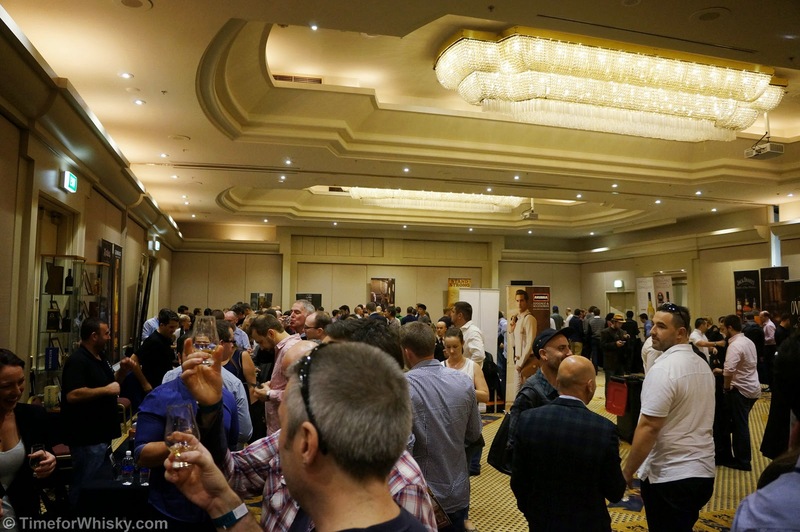 Held for the first time at Mascot (a fair way out of Sydney city compared to previous years' events, though easily accessible on the train from the CBD), the event saw a number of familiar faces presenting the latest offerings from their respective distilleries and distributors. Scallywag Speyside Blended Malt - we'd heard a lot about this blend, and given the enjoyable and well-priced Big Peat also from Douglais Laing & Co, we were happy to start with this as our first dram of the night. Sadly, for me at least, it was a let-down. Too much young spirit and not enough character. Great label and name though. Stagg Jr - I'd been wanting to try this for a while, and it was enjoyable, but for only $30AUD less than the excellent George T Stagg, I know where I'd be putting my money. Tobermory 15, a #101drams dram! I found this to have a citrusy, slightly musty nose, with a drying, tannic, earthy palate and a slightly peaty finish. A decent dram. Sinatra Select - an incredibly smooth, and stunning looking (though pricey) Jack Daniels. A dram worthy of 'ol Blue Eyes for sure. Bruichladdich "The Laddie" Classic - another #101drams dram. Grain-driven, but smooth and with a sweet nose. Sweet vanilla palate with hints of dark chocolate. A medium length finish with wafts of smoke, though certainly not what you'd call an overly peaty whisky. Glen Grant Five Decades - an interesting concept and one which I'd been wanting to try for a while. Created to pay tribute to Master Distiller Dennis Malcolm, this contains Glen Grant from 5 different decades. Enjoyable, as long as you're not expecting to taste a 50 year old whisky. Octomore 6.1 Scottish Barley - you may not like peaty whiskies, but you have to appreciate what Bruichladdich have done with each of their Bruichladdich releases. Far from just being "overbearing peat monsters", they've released some truly unique, distinct and collectible whiskies. The 6.1 Scottish Barley was no different. Peaty, sure, but so much more than that. Laphroag Select Cask - a lot has been said about this dram and I tend to agree with a lot of it. Not exactly my taste - too much young Laphroaig, and for the money, I'd rather drink the reliable, standard 10yo any day. 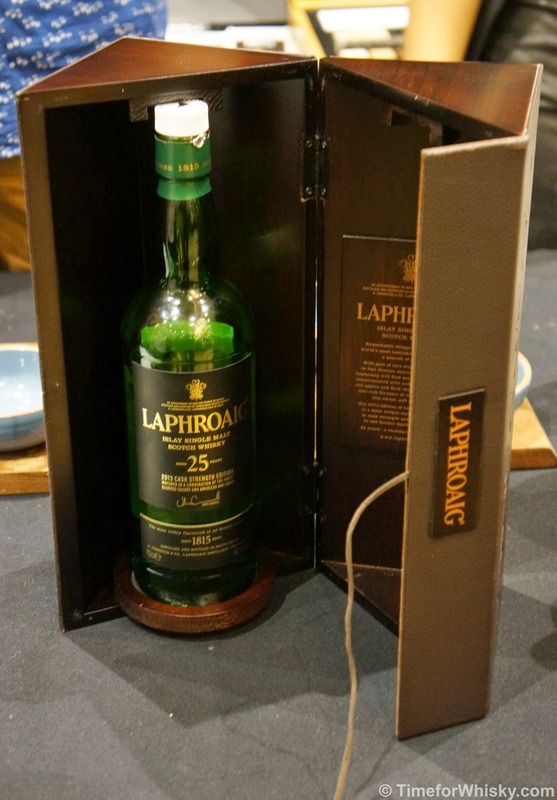 Still on Laphroaig though, we were fortunate enough to try the very rare Laphroaig 25yo, at cask strength. With a sweet nose (with muted peat influence), a citrusy, ashen palate and a great mix between the stereotypical medicinal notes and chocolate sweetness on the finish, this was a fantastic dram. I gave it a 94, which probably doesn't tell you much, but it does give you an idea of some of the other drams in it's league, in my opinion. SMWS - nothing but brilliant drams throughout the whole lineup, as expected, including the 39yo 21.27 "An Enticement of Sweet Oak". Balvenie 15 - but wait, that was already one of my favourite drams. 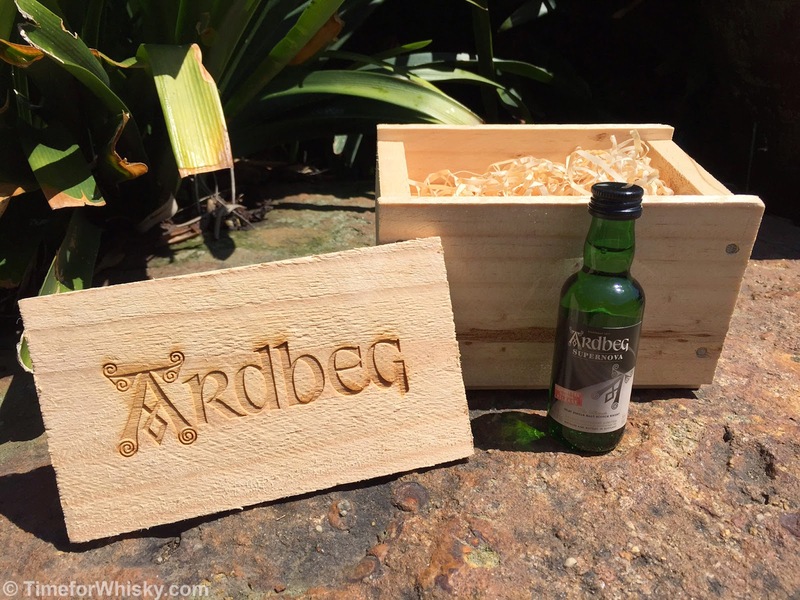 Why include it here as a "dram of note"? Well, Mr James Buntin (who readers of this blog would be familiar with, and who has recently taken up the coveted role of UK Balvenie Ambassador) was representing the William Grant & Sons single malts, and brought along two bottlings, both the older, Bourbon-aged 15yo, retail bottles. Yet the two were incredibly different! One was peppery and spicy and the other had these incredible honied notes. Both stellar whiskies, but it just goes to show you how much influence a single cask can have over the lifetime of a whisky. There were far too many interesting and enjoyable whiskies to mention - including Berry Bros & Rudd with a large lineup of Glenrothes, Pernod Ricard with the usual fantastic assortment of Chivas and Glenlivet whiskies (and Strathisla, Scapa and Arberlour thrown in for good measure), Starward,Diageo with a few of the newer Talisker releases, the usual Aussie contingent (Lark, Overeem etc..) and plenty more. Last week I headed back to The Whisky Library (which we featured recently) to chew the fat with their whisky guru Marlon, and taste two recent whisky arrivals (and a sneaky rhum agricole thrown in for good measure). 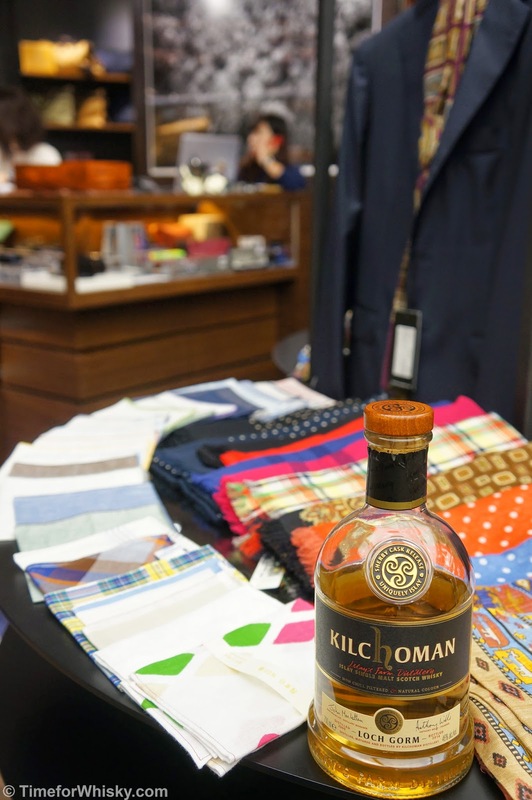 The whiskies to be tasted were Douglas Laing Old Particular Glen Grant 18yo (48.4% ABV, $1,550HKD) and Kilchoman Loch Gorm 2014 (46% ABV, $1,150). Having tasted and enjoyed the 2013 Loch Gorm earlier this year when Anthony Wills visited Sydney, I was keen to see how the 2014 stacked up. The rum, a 45% ABV Rhum Agricole from Guadeloupe, bottled by Samaroli (who I suspect you'll hear more of now that we're based in Hong Kong) was a unique way to finish off the tasting. 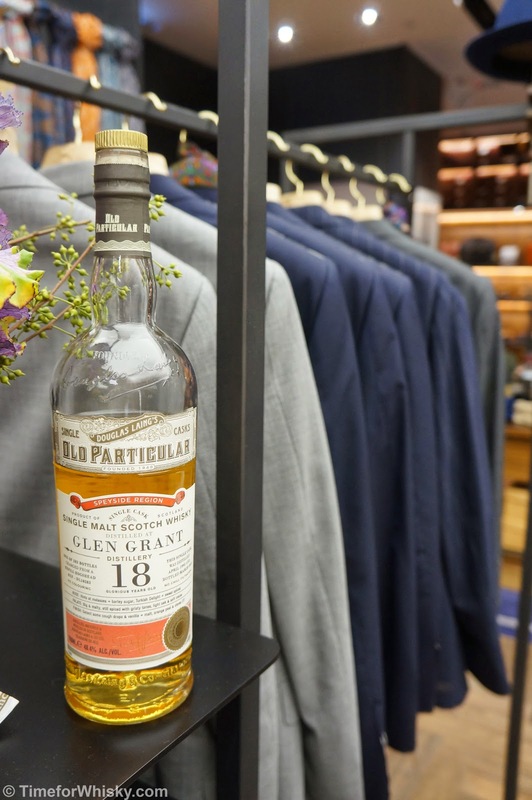 The setting for the photos was the stunning The Armoury store in Landmark Men, conveniently connected to the Whisky Library. 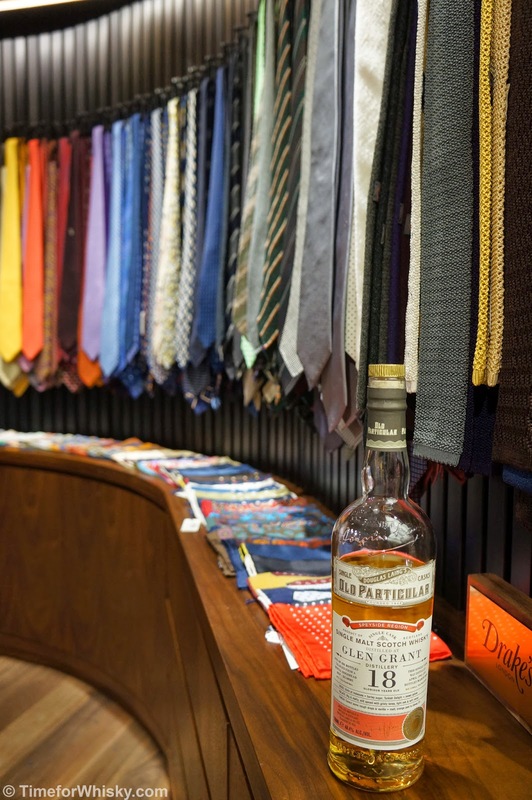 Fine spirits and fine suits - a perfect match. Nose: Vanilla, toffee and hazelnuts. 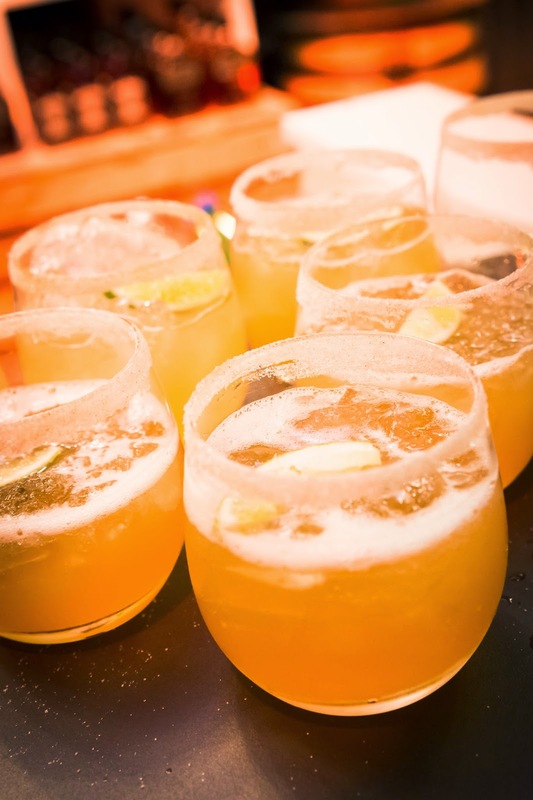 Palate: Spice, but sweet. More cinnamon than paprika. Toffee notes. Some heat, but not excessively so. Finish: Long and smooth, with some lemon notes and a continuing cinnamon tinge right to the end. Rating (on my very non-scientific scale): 92/100. A fine example of a middle-aged, enjoyable, reliable Speysider. Nose: Campfire smoke and raspberries. Palate: Deep intense smoke, but not in a "bite your head off" style like some other younger Islay malts. but not bite your head off. Toasty cinnamon with some berries. Finish: Long, smoky and earthy. Rating (on my very non-scientific scale): 93/100. An improvement on the 2013 release I think - less bananas and youth, and more of a well-rounded, full-bodied Sherried Islay whisky. Can't wait to try future releases. Nose: Citrus - lemon and grapefruit mostly. Palate: Smooth, very smooth. Very light and "thin" when compared to the previous whiskies. Boiled lollies predominantly. Very easy-drinking. Finish: Medium to long, with oranges, apples and a hint of toffee at the end. 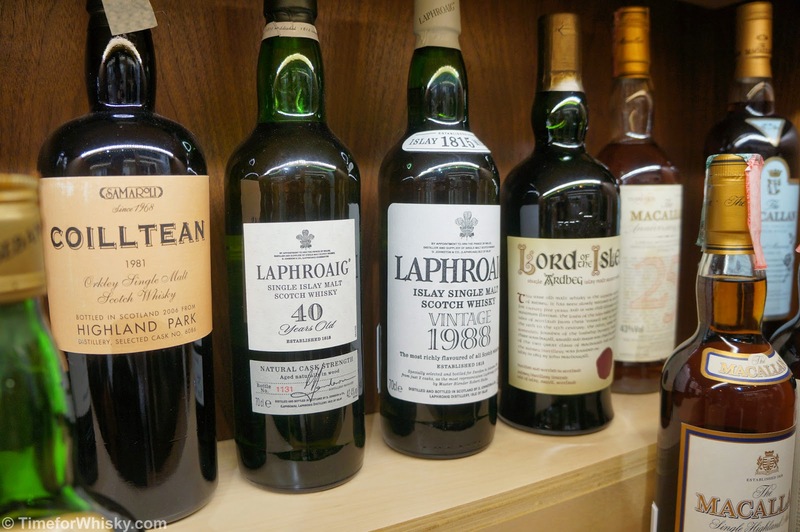 Whilst none of the whiskies in the photo below were tasted, I noticed this 40yo OB Laphroaig on the shelf and just had to include a photo (the company it keeps isn't too bad either). Bottled in 2000 at 42.4%, it's not too often you see an OB Laphroaig that was distilled in the 1960's!